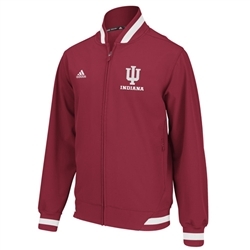 From ADIDAS comes the Sideline Transition Jacket in crimson 100% polyester fabric and ribbed striped accent on neckline, waist and cuffs. Full-front zip with zippered pockets. The IU logo and ADIDAS logos are nicely embroidered along with an oversized woven IU logo over the left chest. Go Hoosiers!